I like explaining the plot to Ascension because no one seems to realize that there is one. Come on guys, this stuff is important! Way back in Return of the Fallen we climatically got to face the first god that needed to be slain, Samael. Well turns out he had a son who was being held in a crystal prison in the Void. When Samael died his son got kind of mad about it and shattered his prison. Now wouldn’t you know it, those shards starting showing up all over Vigil. I guess people began to figure out that something wasn’t right when the dark energy shards started appearing. That’s about when Erabus, son of Samael showed up to unleash some darkness. Or he is the darkness and he’s being unleashed? Either way, it’s time to slay another god! 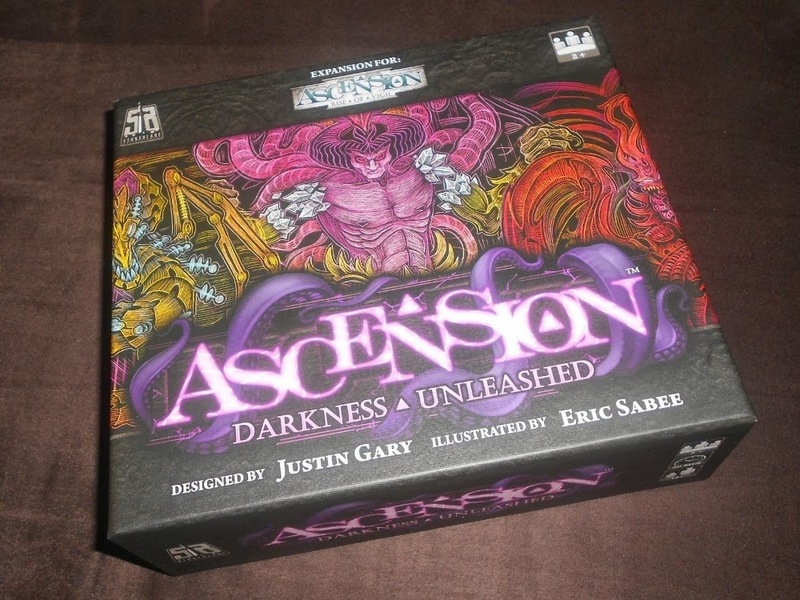 Ascension: Darkness Unleashed is the small expansion for Rise of Vigil which completes the third block. We have previously looked at Ascension and Rise of Vigil, I’ll assume that you have knowledge of both of those games in this review. Darkness Unleashed contains everything that is needed to play so it may either be played as a 2-player stand alone game or combined with Rise of Vigil (and other Ascension sets). It includes start decks, Mystics, Heavy Infantries, honor tokens, and most importantly a new set of cards for the center deck. The center deck in Darkness Unleashed contains 65 new cards and 20 treasure cards (10 Energy Shards and 10 Dark Energy Shards). This can be mixed with Rise of Vigil’s 100 cards and 30 Energy Shards to make a very large center deck. There’s the normal mix of Heroes and Constructs equally distributed between the four factions as well as monsters, including Erabus himself. There are two new notable card types that are added in Darkness Unleashed. The first is the anticipated new treasure card, the Dark Energy Shard. It is effectively the same as the regular Energy Shard but has a Fate effect that allows all players to banish a card from their discard pile when it come into the center row. There are only ten Dark Energy Shards so you’re unlikely to see more than a few of them when combine with Rise of Vigil. The other new type of cards are ones that have the Transform ability, a special Energize power. Unlike normal Energize powers, once Transform is triggered the card permanently changes into a more powerful version for the rest of the game. It is effectively an Energize power that only needs to be triggered once and then stays active for the rest of the game. There are two in-game implementations for Transforming which allows you to choose the one you prefer. 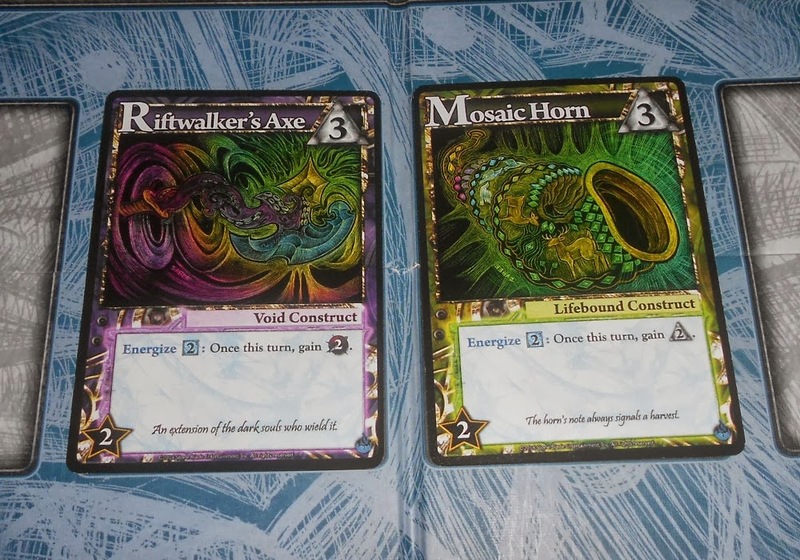 The first has two separate cards, the regular version which is mixed in the center deck like normal and the other is set aside. When the cards is Transformed, it is banished and the Transformed version is taken in hand. The other implementation has two sided cards with the regular version on one side and Transformed version on the other. This only works when sleeved in opaque-backed sleeves allowing for only the active form to be shown. When Transforming you actually take the card out of the sleeve and put it back with the Transformed form showing. Each faction has two different cards which can transform. 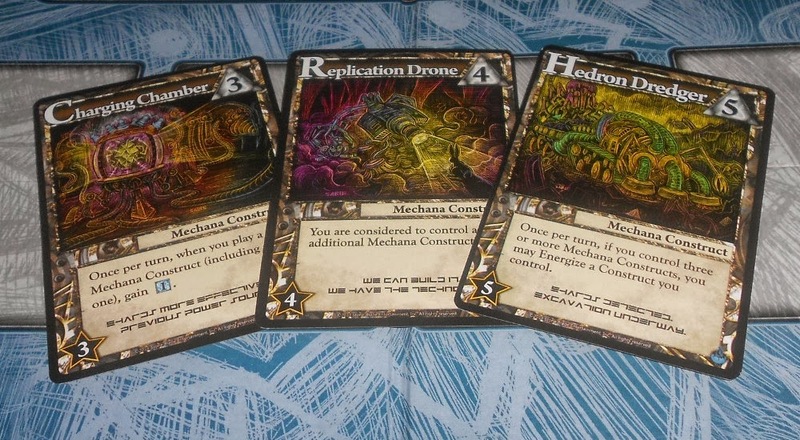 The first is a hero that costs 2 and is very weak but transforms into a card that would normally cost 5. The 2-cost Lifebound hero for instance, Honiskrot Tribesman, provides 1 Rune just like an Apprentice. However, once it is transformed into the Honiskrot Chieftan it provides 3 Runes and increases in honor from 1 to 3. Each faction has heroes to Transform! The regular form on the left and Transformed on the right. 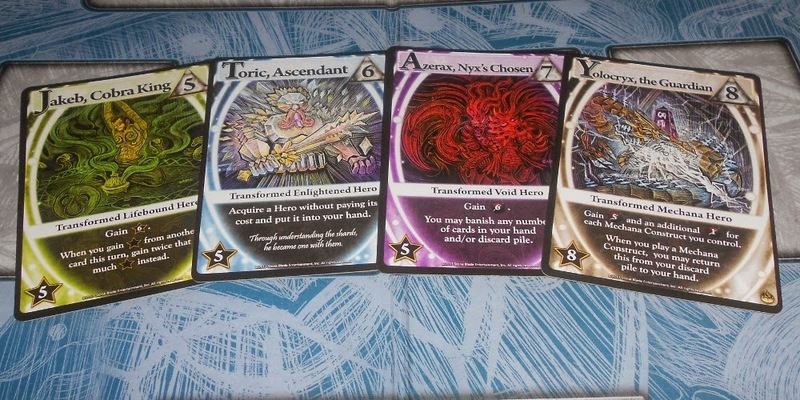 There is also one unique card for each faction that has a very powerful Transformed form. Unlike the 2-cost heroes, the higher cost cards are still useful in their regular form but you are overpaying if you don’t Transform them. These cards fit very strongly within the theme of their faction and have abilities that are powerful enough to swing the game in your favor because of how hard they are to acquire and Transform. 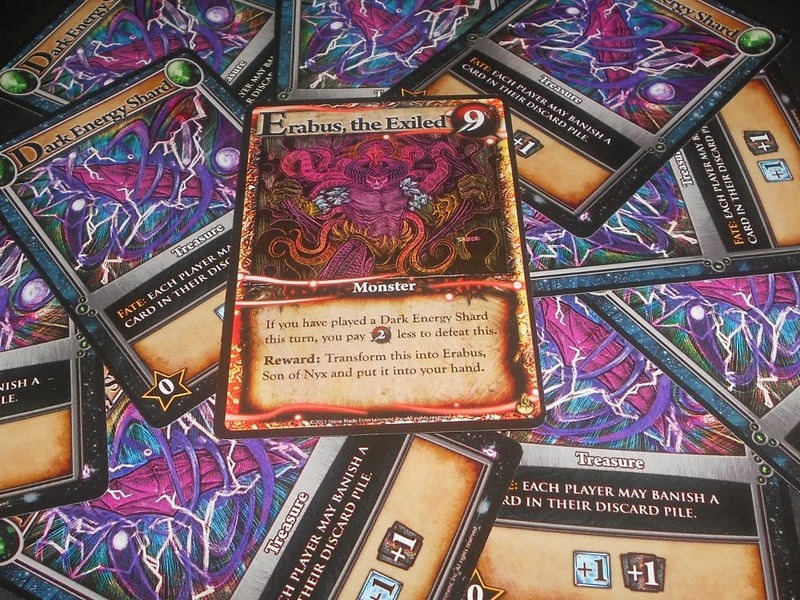 The last card that can Transform is the big baddie of this set, Erabus the Exiled. At a whopping 9 Defense he is the toughest monster yet (if you don’t count promos) but has a weakness to Dark Energy shards. What makes him so unique is the fact that when you kill him he Transforms into a hero, Erabus Son of Nyx and goes right into your hand. The rest of the cards largely deal with Energy, allowing you to generate and use it in both new and familiar ways. There are a few utility cards that don’t care about Energy at all but they are there to provide interesting interaction within the Vigil card mix. Darkness Unleashed can be played as a 2-player standalone game but I have not played it that way despite my preference for Ascension as a 2 player game. 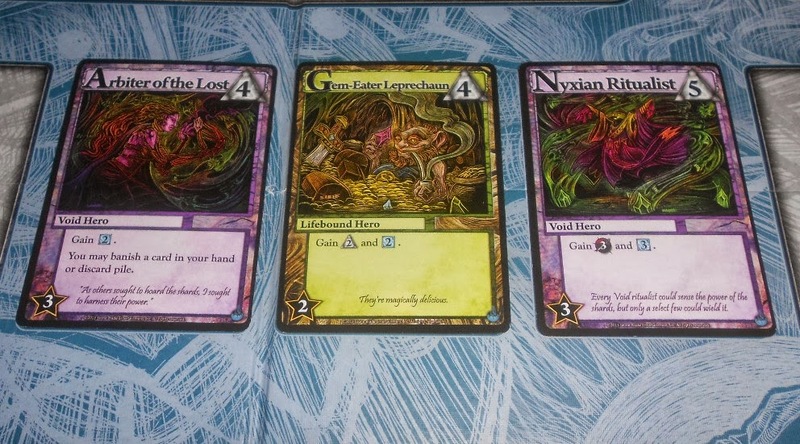 I did play the expansion for the first block, Return of the Fallen, as a standalone but found that games got very samey after a while and have since prefered a larger center deck for the added variety. So from here on I’ll be talking about Darkness Unleashed within the context of being mixed with just Rise of Vigil. Since Rise of Vigil came out the response to Energy and Treasure has been quite polarizing. Energy allows players to pull off very powerful turns and creates exciting moments. I believe that the philosophy behind Rise of Vigil is to make games more memorable by having these exciting moments. Storm of Souls used Events to create a similar story telling element but Rise of Vigil seeks to push this even further. Right down to the Fate effects, there were some things that you might see once every ten or twenty games. There’s a fine line between allowing players to feel very powerful without actually imbalancing the game in their favor and I believe that was Rise of Vigil’s intent. However, this can lead to frustrating games if you end up having to watch other players experience these exciting moments without getting the same experience yourself. Some people feel like it makes Ascension too swingy, removes skill, and creates runaway leader problems. I’ll come back to that later when I look at how Darkness Unleashed addresses this. It generally seems like most players are divided between wanting Ascension to emphasize skill (Storm of Souls) or excitement (Rise of Vigil). Darkness Unleashed seeks to carry forward Rise of Vigil’s philosophy by adding even more exciting elements to the game. 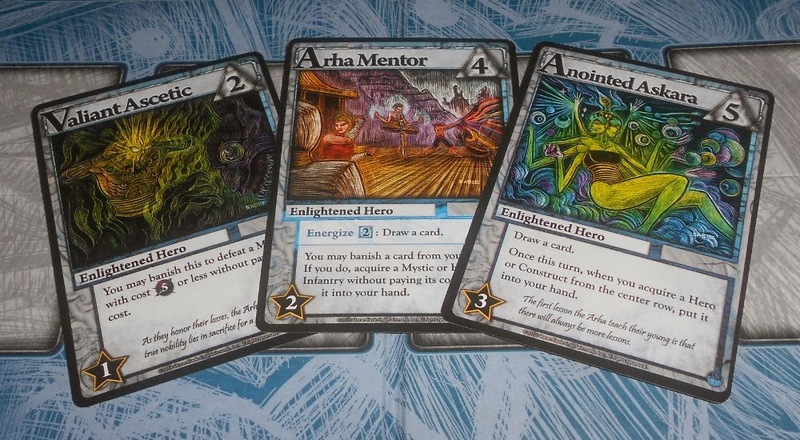 However, the card mix is largely more nuanced or complicated than Vigil so it does promote a higher skill level. I don’t believe this is intended to “fix” Rise of Vigil, these cards mix in very naturally and they certainly didn’t shy away from very powerful cards that require Energy to be effective. This set still puts Energy front and center but strives to smooth things out a bit by creating more opportunities for divergent strategies. This may convert some who didn’t like Rise of Vigil but it will certainly give fans of that set more of what they loved. So let’s start by looking at the new exciting elements introduced in Darkness Unleashed. First off we have the Dark Energy Shards. Banishing has been a bit of a rarity so having a Fate effect with banishing show up is a big deal and will generally lead to quicker and more efficient decks for all players when they are more prevalent. Even more exciting though is the new Transformation mechanic. There was something very satisfying about getting the boost from your Energize effects, feeling like you unlocked hidden potential in your cards as you gathered more and more Energy. Transformation adds a visual representation of this energizing moment and lets you actually witness your heroes evolve into more powerful forms. The Transformed hero has a new name and fresh face to reflect his powerful new state. The card frame itself actually bends on the sides as if the hero is bursting with power. With the unique higher cost Transform cards you also get a very powerful ability that can drastically alter your strategy even more so than the highest cost cards of other sets. But this hero wasn’t just bought, he was made. And where Rise of Vigil was somewhat lacking in faction identity these heroes help to embody each one. Most exciting of all is Erabus, the son of Samael, that Transforms into a hero and joins your side when he is defeated. You get to experience his redemption as he exiles the monsters that he unleashed on the world. I like how they continue to create really unique and thematic rewards for the big monsters that are tied to the new mechanics. Even the lesser of the big monsters in this set, Smoke Tyrant, is very exciting to kill. Much like Erabus, it is linked back to Energy in a unique way letting you permanently generate Energy from Treasure pulled off the top of the center deck. Now on to a more strategic note, how does Darkness Unleashed affect the actual gameplay of this block? I feel that it opens up more strategies, preventing an early lucky grab from dominating the game. The most classic example across all blocks is early banishing. That’s where the Dark Energy Shards come in, their presence can be quite important for helping to rein in early banishing. Their Fate effect is somewhat equal opportunity in nature, allowing all players to banish a card granted they have something bad in their discard pile. While this may seem to arbitrarily help players based on how far along they are in their deck I feel that it generally helps players that have banished less cards. If you have more junk then you’ll be more likely to have some of it in your discard pile when a Dark Energy Shard appears. Now this won’t always be the case but it will often help players that are behind on banishing to catch up. There are also more cards that let you banish then in Rise of Vigil: one monster, and four heroes for a total of 10 out of the 65 cards (compared to Vigil’s 12 out of 100). Looking at Rise of Vigil in particular there are two scenarios that can be hard to come back from. The first is an early Energize advantage, being able to grab a couple of Energy Shards and one or more Energize cards right off the bat and then drawing them together to get a notable advantage. Most guilty here is Lifebound Muse who can give you access to high cost heros easily and snowball for there. The second advantage is a significant Energy disparity, with one player hogging most of the Energy as it shows up and using it to both consistently trigger Energize effects and get a big reward off of certain cards that care about generating a LOT of Energy. I’ve found the first scenario to be rare and the second to be less common with experienced play but both situations are often hard to recover from because of the importance that Energy plays in most strategies outside of a Power heavy deck. Darkness Unleashed provides a lot more room for divergent strategies, especially ones that are not as reliant on a consistently high generation of Energy. Most of the new Energize abilities require a manageable 2 Energy including an excellent pair of Rune and Power generating constructs. Likewise there are several new heroes that provide 2 Energy, a great supplement for when Energy Shards are scarce. The Transform effects only have to Energize once and then are powered up for the rest of the game so having a steady flow of Energy is less important. Rune based and hybrid (Rune/Power) strategies are provided with more options as Mechana is able to more easily Energize their constructs and Enlightened received several very flexible cards. The cheap Transform cards also play to the strength of the hybrid deck by providing an excellent source of both resources and card draw. Include a Reality Sculptors or two and you’ve got a very flexible deck that can operate without needing a lot of Energy. The cards in this set continue to provide the same challenge of building a deck that attempts to balance generating Energy with actually being able to effectively use that Energy. In particular the cheap Transform cards and the pair of constructs that I mentioned previously will actually make your deck less efficient if you aren’t able to Energize them. Particularly in the early stages of the game when these cards show up it’s a tough decision to know how long to wait before grabbing them. I have found with the higher complexity of the new cards and increased prevalence of banishing that turns can take longer than in Rise of Vigil. I still find that it plays quicker than the second block (Storm of Souls + Immortal Heroes) and I’m more than willing to let the turns go longer for the added bit of complexity and efficiency. Darkness Unleashed provides an excellent addition for those that loved the feeling of excitement that Rise of Vigil provided. I would absolutely recommend it to anyone that enjoyed that set as a way to explore even more strategies within the framework that Vigil created. However I’m not sure that the changes will be significant enough to sway back those that detested the implementation of Treasure and Energize effects. I’d view it more as a way to win over those that are sitting on the fence rather than a complete rehaul to appease those on the other side. If you really wanted the Energy mechanic to shine but didn’t like what Rise of Vigil had to offer than this may be what will win you over. However, if you really disliked what Energy brought to Ascension then it’s probably better to wait for Block 4. Rest assured they’ll explore new mechanics that may finally unify all Ascension lovers. > I like explaining the plot to Ascension because no one seems to realize that there is one. Come on guys, this stuff is important! I had to laugh at that. I think I have finally found someone as interested in the lore and storyline of Ascension as I am! 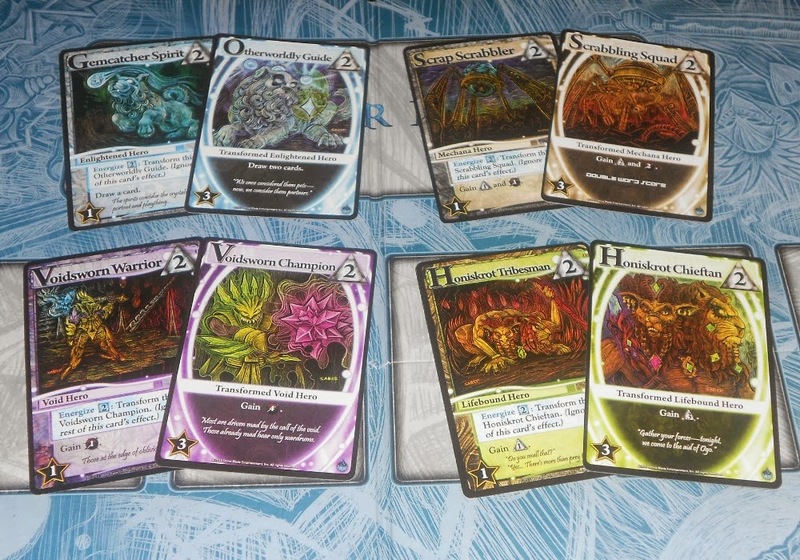 I just discovered iSlaytheDragon and enjoyed reading your reviews of the Ascension expansions. Please consider writing a review for the new Dawn of Champions expansion should you acquire it.